Well, it's more of a metaphorical Yeti...obviously. While the light bulbs are still being screwed in at TeddyandtheYeti.com, I'd like to take a little moment and welcome you to what is sure to be the most important event of your life - your formal introduction to the world of Teddy and the Yeti. Take a step back and revel in the realization that not only are you witnessing something akin to the birth of a new galaxy, but you more importantly have the wherewithal to realize the importance while still in the moment. Plus, if you jump in on the ground floor, you can shake your fist with bitter consternation after the creators of Teddy and the Yeti become self-important big headed Hollywood types, cynically shouting your protestations of "I was THERE, man! From the BEGINNING!" Whether you picked up the increasingly free Teddy and the Yeti "To Sleep" promo, were directed here by a well-meaning friend, or just happened to stumble upon this corner of the Internet(s) by some sort of fortuitous happenstance, I thank you for showing you and being a presence. The comic book industry is ever a fickle mistress, and so all of the creators appreciate, if nothing else, you curious, open-mouthed stares and occasional poke to the ribs, whether you are actually buying hte book off of the shelf or merely trying to trap some of that new comic smell from participating in what is sure to become a bustling internet community, replete with its requisite flamers, spammers, bloggers, and lots of other personal descriptions that end in -ers. In the weeks to come I hope to use this handy blog to its full extent. 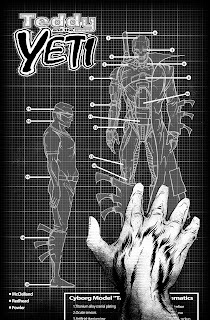 I want to keep everyone updated on progress that is being made (I promise you, it is...) with the book and website; I want to introduce you to the creators that are bringing you this newly-necessary content; I want to inundate you with extras and behind-the-scenes material from not only Teddy and the Yeti, but other random comic book work from various creators; I want to make each of you a chicken sandwich...which, oddly enough, I feel equally at home adding ketchup as I do mayonnaise, lettuce and tomato. That last one might or might not prove to be the most difficult. So please, please...if you are just stumbling onto this page, give us a little time to get set up. In the near future there'll be actual content to view online as well as a full-length comic book to read and buy for cash money at your local comic book establishment. We're all working hard to tell stories that are both fun to read and of the highest quality possible. So stick around and check back! We'll have lots of fun. How could we not with a title like "Teddy and the Yeti?" It RHYMES, people...it RHYMES! While we're waiting, check out the cover to our giveaway issue 0 (because zero issues are cool in the "zero" is theoretically nonexistent), which, despite my many attempts to change its position to give it more relevance, remains at the top of this post.